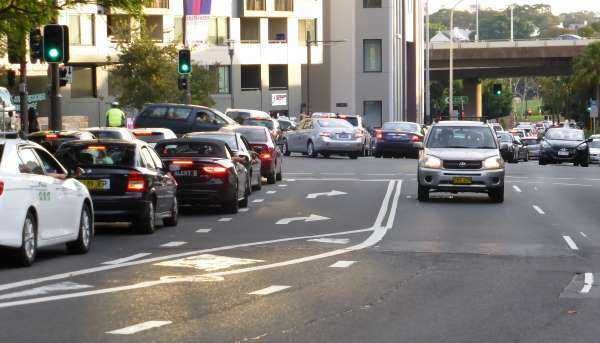 This article covers intersections, roundabouts, lane use and traffic light rules in New South Wales, including where road traffic intersects with other traffic like pedestrians, cyclists and trams/light rail. Intersections will be controlled by traffic lights or give way and stop signs, or they could be uncontrolled with no lights or signs. When there’s a STOP sign it is compulsory to stop even if you think you can see the way is clear. If it’s a GIVE WAY sign, then you must be prepared to stop if there’s other traffic coming. You must always use your indicator to let other road users know what you are doing including when turning, overtaking or changing lanes. Even if you don’t think you see another vehicle, there might be a bike or pedestrian that you haven’t seen. Instructions from a police officer override signs and lights at an intersection. If there is a traffic controller in the intersection you must obey what they tell you. As you approach an intersection you should check for traffic on your left and right at all times. If it’s a crossroads, look for traffic coming towards you that might turn right in front of you. Pay particular attention as cyclists and motorcyclists are more difficult to see at intersections because of their smaller profile. Look twice in case you missed something on your first glance. If there are no traffic signals at an intersection and it is unmarked then you must always give way to your right. As you approach the intersection drive at a speed that gives you enough time to stop if traffic suddenly appears. Look for clues of traffic coming as you approach the intersection – for example you might see dust rising off the road, or if you have your windows down you might hear approaching vehicles. If you are at an unmarked crossroads and you are turning right then you must give way to any vehicle coming from straight ahead and turning left, and any vehicle coming from the right that’s going straight ahead or turning right. If you are turning right at a T-intersection from the bottom of the T, then you must give way to your left and right to vehicles crossing the top of the T.
This second example of an unmarked T-intersection demonstrates that even if someone is turning in front of you you must wait for them if you are on the bottom of the T.
When you are facing another vehicle at a crossroads, if you are turning right you must wait for any vehicles coming straight through or turning left. Therefore in the diagram below vehicle P has right of way over vehicle O. If a STOP or GIVE WAY sign has been knocked down, for example, as the result of an accident, the line marked across the road indicates the meaning of the sign, and must be obeyed. If there’s a stop sign, but no line then stop before coming to, and as near to, the intersection as possible. You can always edge forwards to get a better view after you’ve stopped. Vehicle at a STOP sign have the lowest priority of all other signs at an intersection. In the example below, vehicle O must wait for all other vehicles to complete their manoeuvres. If both opposing vehicles have the same class of sign, e.g. two stop signs or two give way signs, then the give way rules apply. If both vehicles are turning right then they don’t need to cross each other’s paths. When you come to an intersection and the road beyond is choked with vehicles going in the same direction you must wait until there is room to completely cross the intersection, even if your traffic light turns green. When travelling on a laned roadway, right turns must be made from the right-hand lane unless there are right-turning arrows in other lanes. In the example below you can see traffic turning from a one-way street. The left-hand lane traffic can also turn right. Any vehicle wanting to turn into the road at X would use the left hand lane. If there are no lanes marked on a one-way street and you want to turn right, make the right turn from the right-hand side of the road, as shown in diagram R below. The diagram below shows a marked pedestrian crossing at an intersection. There is also a STOP sign at the intersection. Even if you have already stopped for a pedestrian you must stop again at the STOP line. At intersections where the road turns, watch to see who has the give way or stop sign to determine who has right-of-way. In the example below, the car at J must wait for the other cars. The rules for a roundabout are that you must always give way to traffic already on the roundabout and you must use the appropriate lane. You can see in the photo below that the right-hand lane can be used for turning right and going straight ahead, whereas the left-hand lane can be used for turning left or going straight ahead. In the image below if you want to go straight ahead at the roundabout you would signal left as you pass point O. In the following example the motorbike should be cautious about the car on the roundabout as it could be leaving the roundabout and therefore cut across in front of the motorcyclist. 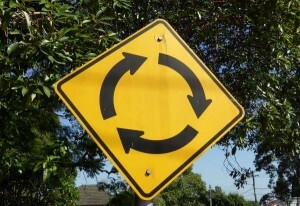 When turning left, approach the roundabout in the left lane indicating left and continue indicating while you make the turn. Exit the roundabout in the left lane. When going straight ahead, approach the roundabout in any lane marked for going straight ahead and don’t indicate. Indicate left as you pass the exit before the one you want to take. Leave the roundabout in the same lane as the one you entered in. When turning right, approach the roundabout in any lane marked for turning right (usually the right-hand lane), indicating right. As you pass the exit before the one you want to take, signal left. If there are two lanes on your exit road then you will exit onto the right-hand lane. If you want to travel completely around the roundabout it’s like an extended right-hand turn. Simply keep the right signal on until you’ve passed the exit before you want to exit the roundabout, then exit into the right-hand lane, like in this diagram. Therefore in the image below, the red car is not in the right position to turn right at the roundabout because is in the left-hand lane. When entering a freeway or motorway from an on-ramp you should merge like a zip: match your speed to that of the traffic on the freeway and look for a gap to slot yourself in. If you are following other vehicles onto the freeway don’t force yourself into the line of traffic. Merge one-by-one, allowing other vehicles on the freeway enough time to adjust their position. If you try to merge more slowly than the cars on the freeway you create a dangerous situation as vehicles on the freeway will need to brake to adjust to your speed. This increases the risk of nose-to-tail accidents and slows all traffic up, i.e. by merging slowly you contribute to traffic congestion. When two roads merge into one road, the vehicle that has to cross the lane line must give way. If two lanes merge into one without a lane line, the vehicle that is ahead has right of way. 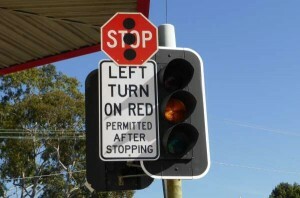 At red traffic lights you must stop if it’s safe to do so then wait behind the line until the light turns green. Traffic light phases are set so that, at the speed limit, vehicles should be able to pull up safely when the light turns yellow without having to drive through the intersection while the light is red. 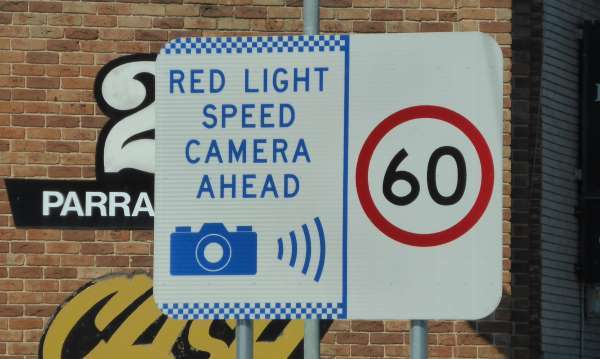 Red light cameras will only trigger if you enter the intersection when the light is red. Traffic lights have the phasing red, green, yellow, red. On some intersections you will find a red turning arrow which means you can turn on a red light if the turning arrow is green. The signal below shows that traffic going straight ahead or turning right must stop, whereas traffic turning left can go (but must wait if there are any pedestrians crossing the road). 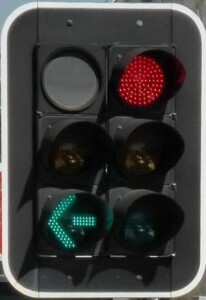 A green light means you can turn left (if there are no crossing pedestrians), go straight ahead, and turn right (if you give way to traffic coming towards you. At some intersections with lights a left turn is permitted after stopping, and it will be shown in a sign like the one below. You must not make a u-turn at traffic lights unless there is a ‘U-TURN PERMITTED’ sign. Even if it’s the middle of the night and there is no one coming, you must not go through a red light. If there is another vehicle blocking the exit where you want to go, you must not go, even if you have a green light. 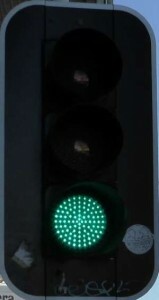 Temporary traffic lights are sometimes installed at roadworks and they should be treated as any other traffic light. The sign indicates where it is safe to stop. Also, some automated lights have a sensor for vehicles waiting at a red light so they know to turn the lights green again after a certain period of time. Parking forward of this sensor may mean the light does not change green. 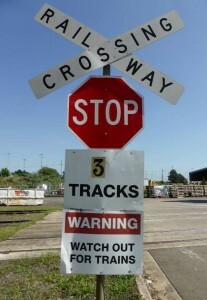 When approaching a railway level crossing that displays a STOP sign then you must stop. If there are boom gates down and flashing red lights then you must also stop, and you must not cross the railway until the lights have stopped flashing and the boom gates have lifted. Trains cannot brake quickly so won’t be able to stop if there is a vehicle blocking the tracks. If the railway level crossing has a red triangle then you must slow down and be prepared to stop if there’s a train coming. Even if the signals are not flashing, it’s a good idea to slow down and check left and right before you cross. If you can’t cross the railway level crossing without clearing the crossing completely (e.g. there is traffic backed up the other side of the crossing), don’t cross until it’s clear. If you are turning at an intersection and pedestrians are crossing the road, you must give way to them. 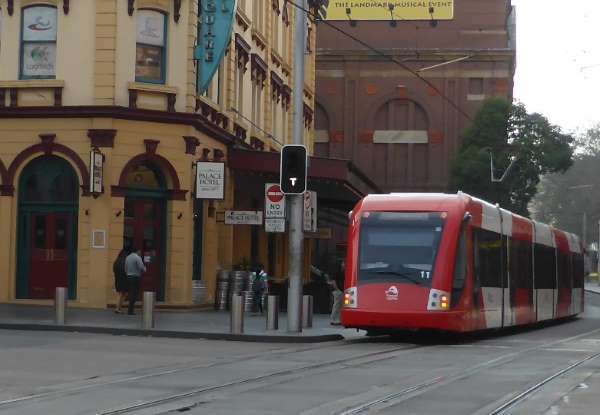 If you come to an intersection in Sydney with a Light Rail vehicle about to enter you must wait until the intersection is clear. When exiting a driveway you must give way to bicycles, vehicles and pedestrians. If there are no lanes marked on a road, drive near to the left hand edge. If there are lanes, then you will adjust your position based on traffic around you. For example, if you are overtaking a line of parked cars you will move more to the right of your lane; if there’s a large vehicle coming towards you, you might move left in your lane. You will predominantly travel in the middle of your lane, though. There are painted lines in the middle of the road to tell you what you can do. On a multi-lane road with a speed limit of 80kph or more, you should drive in the left-hand lane unless you are overtaking. The road in the image below has a double unbroken dividing line therefore the purple car can only cross it to turn into a driveway (assuming it’s safe to do so), not to overtake another vehicle. The line is broken where there is a side street. The same would apply even on a country road with a double undivided centre line – it means you are not allowed to overtake because it could be dangerous to do so due to the road layout or visibility. If the road has a broken white line on your side of the centre, then you can also cross it to overtake. When riding on a single lane road a motorbike can legally use any part of the lane. Before changing lanes you must first check your mirrors, then signal your intentions, then check your mirrors and blind spot, then make the manoeuvre. Even if you can’t see any other road users around you must still indicate for at least five seconds because there could be a motorcyclist, cyclist or other road user you haven’t seen. As you pull away from the kerb the last thing you should look over your shoulder and check your mirrors. This helps you avoid hitting other road users. A transit lane is a lane reserved for vehicles with defined minimum number of occupants. For example, a T2 lane must have a driver and at least one other occupant whereas a T3 lane must have a driver and at least two other occupants. T2 and T3 lanes can usually be used by cyclists, motorcyclists and buses, too. If you drive into a transit lane without the required number of passengers you will be fined if caught. If they are time-limited then the operational times will be displayed on the sign, for example 6am-10am Monday to Friday. You are allowed to travel in a transit lane with less than the required occupants if you are turning left into a side street or driveway, but only for 100m before the turning. A median lane is a lane designed to allow vehicles to wait to turn right, or vehicles from a side road to enter and wait for a gap, without holding up the flow of traffic. The median lane may have turning bays. If your vehicle won’t obstruct the path of other vehicles you can turn into the median lane and wait. In the case of the diagram below, vehicles Y and O can both move into the lane and wait without crossing each other’s trajectories. You are not allowed to park in a median strip. 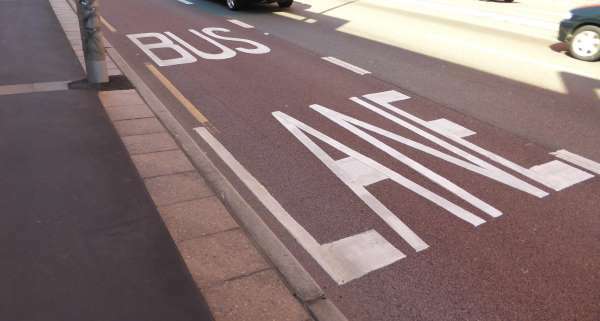 You must not drive in a bus lane if it is only reserved for buses unless you are driving a taxi or hire car. 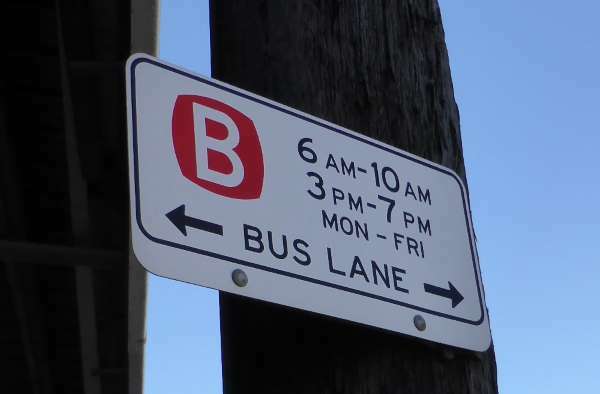 Bus lanes can be indicated by several different types of signs indicating the direction of the bus lane and (if it’s not a 24-hour bus lane) what times it is in operation. Painted road markings will reinforce exactly where the lane is. If you break down on a freeway then you should move over to the emergency lane on the shoulder on the left (the hard shoulder), then call for help. 1 Pings/Trackbacks for "Intersections, roundabouts, lanes and traffic lights rules"
How do you work out speed vs time vs distance? How are roads designed using the safe system approach? Are racing drivers allowed to drift or race on the road? How do you get over your fear of driving? What are the best ways of keeping the inside of your car clean?